Topic: Use guitar pedals for bass? Re: Use guitar pedals for bass? Lots of bass players use guitar effects. I use a hotcake and it's great. Just kidding that's my buddy timi's gear. We were using it for recording the other day. Live I use a Jansen Bassman 75, 2x12 cab, Squire Jazz with flatwounds, VT bass, Hotcake and a tuner. www.trademe.co.nz is the ebay site for NZ, check there. Not a lot of deals to be found in second hand music shops in NZ, in my experience at least! You're going to be paying $2500+ for a Fender jazz or p-bass. 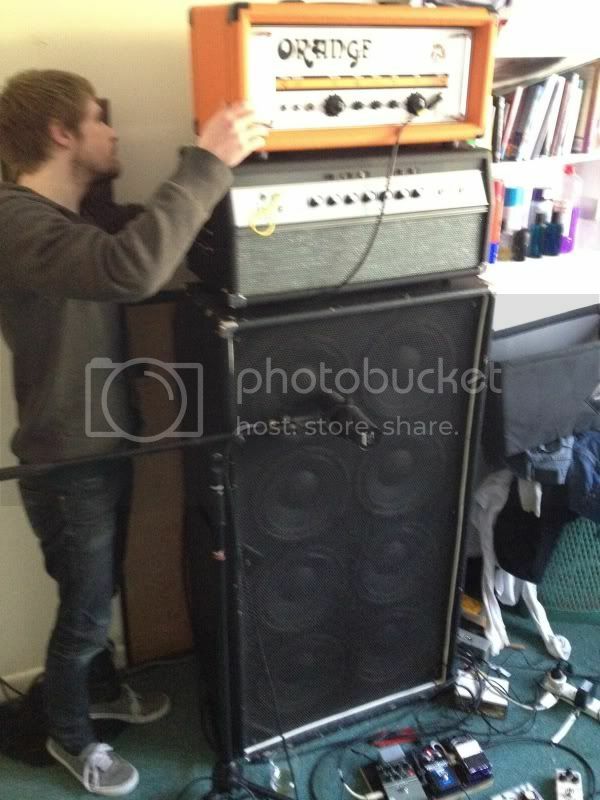 Jazzbass wrote: Good thing for those who do not like the new amps is that there will be a shitload of solid gear for sale on TradeMe coming up as everyone quits their heavy gear. Perfect, I can swoop in and pick up a couple of old Matamps, maybe a Hiwatt and a few Ampegs. Perhaps even a B12. Also, timi has pretty specific requirements with his bass stuff, he wants a pretty certain distorted midsey sound that lots of solid state amps just aren't voiced for. With my limited home recording setup I use an SM57 to record bass, sounds great, not bassy enough for some genres though I'd say. From my experience a booking agent has to LOVE your band if you're not a 'band for hire' or covers band or whatever. Because they will make zero money and it'll take heaps of their time.